An Institution to help the interpretation of Indian Culture by stimulating the study and practice of the Adhyatma Vidya — Philosophy and Religion in its universal aspect-especially as revealed in the Upanishads and allied literature. 1. Has so far published more than TWO HUNDRED BOOKS in Kannada, English and Sanskrit, including useful Kannada translation of the Upanishads, the Bhagavadgita and the Brahmasutras with Sankara’s Commentary, Notes, and other aids to the general reader. 2. Arranges for frequent DISCUSSIONS, DISCOURSES and PUBLIC LECTLRES. 3. Has a LIBRARY and a READING ROOM for the public. 4. Publishing a Kannada Monthly, the ‘Adhyatma Prakasha’ devoted to the dissemination of ideas relating to Jnana, Bhakti and Vairagya (Spiritual Knowledge, Devotion and Non-attachment to worldly things). 5. Teaches the Principle of Universal Religion & Philosophy to Students who desire to enrich their knowledge in Vedanta and propagate the same as ‘Pracharakas’. This little book contains sixteen of the most popular minor Vedantic Works generally ascribed to the great Sankaracharya. Their one common feature is that they are all monographs dealing with either the preparatory path to be trodden by seekers or with the identity with the Supreme Self which every perfect soul feels on realising the truth. These writings contain little or no argument, for they are meant to be no more than fingerposts on the spiritual way, or sign-boards of the highest spiritual ideal for genuine aspirants with unwavering faith in instruction like this. For such, there is little doubt; these songs will be a source of hope, strength and joy. It were well to remember, however, that the truths of Vedanta depicted in these poems are not matters of mere faith and belief. For they relate to the Eternal Reality which is above time, above space and above causality and yet the inmost core of our being. The realisation described here, is not a feeling got through affirmations or mystic experiments; nor is it the conclusion of vain speculation which goes by the name of philosophy. Neither is it a mere theological dogma to which a mental assent is demanded. It is rather the immediacy of the Infinite as the Super Self in which all of us literally live, move and have our being. When that immediacy is attained it will be found that the mystic’s experiences and the philosopher’s speculations as well as the theologian’s assertions are all invested with a meaning only in so far as they approximate to this bedrock of Reality. The Vedantic method of seeking and finding this Reality is barely touched upon here and there in some of the monographs included in this book. The reader who is interested in the study, is referred to my little book ‘Avasthatraya or the Unique Method of Vedanta’ where it is discussed at some length. 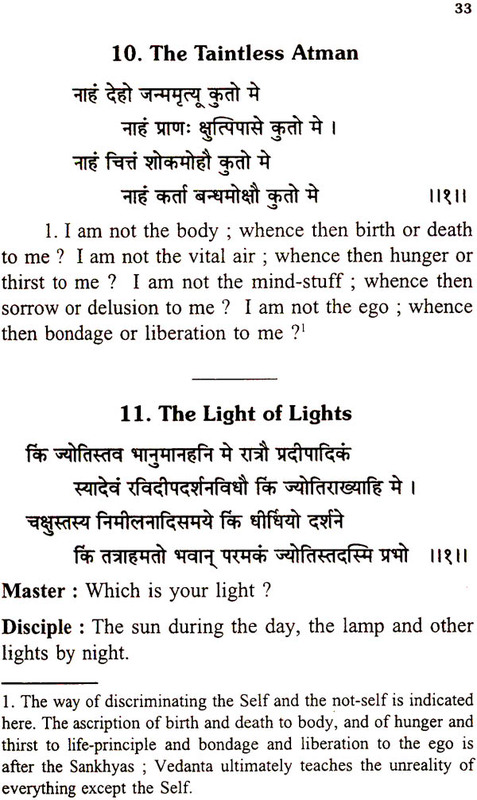 A few observations with regard to the nature of Reality as taught by Vedanta, would be welcome to readers who read a book of this kind for the first time. It is called Brahman or the Infinite because it is not limited by anything. It is Pure Being without attributes, Pure Consciousness desiderating no object, and Pure Bliss not derived from any object of sense. Being, Consciousness and Bliss are not to be regarded as abstracted from existent, conscious and blissful entities, but as the very essence and basis of all phenomena which are superimposed on it by Ignorance. The world of plurality containing numerous individual egoes and objects, is but an appearance experienced by us in the waking state; but as we pass through all the three states, waking, dream and dreamless sleep, quite unaffected by those experiences, our Self as the witness of all three, must be taken to be altogether distinct from the states and their contents. And as both waking and dream are seen to be daily withdrawn into the Self in sleep which freely exhales them again, these must be regarded as essentially one with it. 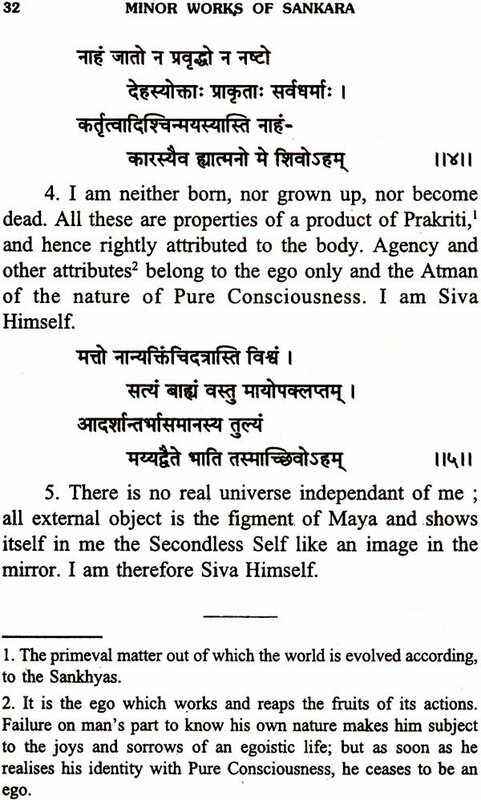 From this stand- point, therefore, the Self is seen to be above all the states, ever pure, ever free, and ever blissful. Having absolutely no characteristics, its nature can be suggested to the men of the world only by negation of all superimpositions. It need hardly be said that in order to realise this truth, the aspirant will have first to put himself in a disposition to understand the suggestion by going through a rigorous course of discipline in virtue of which he will be enabled to rise above all attachment to partial experiences. The various steps in this course are briefly mentioned in some of the tracts given in the earlier part of this book. Detail information on the subject must be gathered from such works as the Bhagavadgita. The vexed question of authorship, whether all or any of these miscellaneous works are genuine productions of Sankara, is not discussed by the present writer for obvious reasons. His one object was to present in book form some of the most popular vedantic hymns and tracts that go under the name of the great Acharya with such aids as would enable an English-knowing rader to appreciate their spirit. If this little publication achieves this end even in a small degree, it will have served its purpose. It goes without saying that to appraise the philosophy of Sankara properly, a genuine student should go direct to his universally accredited works, to wit, his commentaries on the Upanishads, the Bhagavadgita and the Brahma Sutras. This book printed during 1942 was out of print since a long time. As there was a great demand from the readers, we take pleasure in binging out this second edition for the benefit of the Seekers of Truth.